One of the reasons that we decided to stop over in Cleveland on the way home is that it’s a surprisingly good food destination in itself. In addition to one of the better public markets in the US (their famous West Side Market) and a surprisingly vibrant Asian community, Cleveland has a rather impressive assortment of top-notch dining establishments (including such places as AMP 150, Greenhouse Tavern, and Lola). But one chef I’ve been particularly interested in following is Mike Nowak. I first met Mike via a mutual friend when he was a chef at Bar Cento, and more recently enjoyed some of his work at Market Garden, and continue to enjoy both of those establishments (indeed, I visited both on this trip). So when I heard earlier this year that he was opening up his own restaurant, The Black Pig, down the block (in the spot previously occupied by Dragonfly, which I had been to in the past), I was intrigued and made it a point to visit next time I was in town. 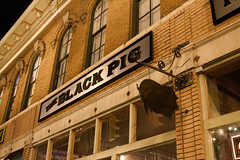 The basic approach of The Black Pig is similar to a lot of other area restaurant, with an emphasis on quality meats and good local ingredients, offered up in a bistro setting. To this point, they did a rather nice makeover of the former Dragonfly space, keeping the same general layout while turning the ambiance from the fairly bright and boisterous that was Dragonfly into a calmer, fine-dining establishment. I rather like the space, actually, even though the darkness always wreaks havoc on my food photography. 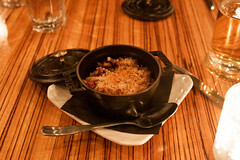 Menu-wise, The Black Pig is basically bistro food, with the bulk of the menu focusing on French-inspired cuisine with a heavy emphasis on seasonal local meats and vegetables. While the overall menu has everything ranging from burgers to vol a vents, we both decided that it was hard to pass up the tasting menu. Like a lot of the other bistros in town, at The Black Pig the chef’s tasting menu is indeed the chef’s tasting menu, with the chef deciding what to prepare for you. At The Black Pig, the chef even comes out to talk to you, so I got to talk briefly with Mike and give him some basic directions (“light on the seafood, otherwise knock yourself out”), and then we kicked back and waiting for the food to come out while I enjoyed a köelsch. 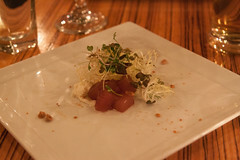 A short while later, our first course came out, a simple poached pear salad on bleu cheese with frisee. A fairly simple salad concept, this was very nicely executed: the pears were poached but still firm, with a nice glaze that combined well with the bitter notes of the greens and the sharp bite of the bleu cheese. This was a very good start to the meal. 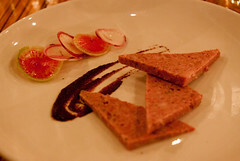 Next up was was a pate course, with three ample triangles of pate served up with a light sauce and some pickled watermelon radish. I always enjoy a good pate, and this hit the spot. The pate was on the coarse end of the pate spectrum, bordering on a head cheese, but for this particular pate it worked out well. A really good balance of meat, fat, salt, and spices combined with a near-perfect texture to make this one of the more pleasing courses of the evening. 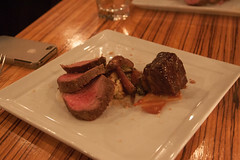 The main course was a standard from The Black Pig’s Menu: the “Ohio Beef” plate with grilled bistro Steak, short rib, carrot and cauliflower. Again, this was a good dish: the beef itself was nicely sourced and flavorful. The steak was cooked to a perfect medium rare with just the right amount of sear, while the short rib was braised just to the point of falling apart. The veggies served as a good base, and the result was a pleasant dish that really highlighted the quality of the underlying meat. After the beef course, we had a short cheese course (which was also nicely done) to cleanse our palates, and proceeded on to dessert. I like the way The Black Pig handles desserts: for most of the tasting menu Carol and I had the same dish, but for the dessert course they deliberately mix it up. 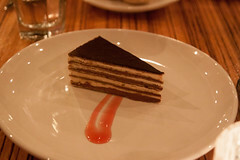 I ended up wit ha very nicely done chocolate crepe cake, built of a half-dozen crepe layers stacked with a ganache, this was a very nicely done dessert. Carol did rather well with a trio of macarons as well, and we both got to sample the other person’s dessert. The Black Pig really did a good job with this dinner, and it pleases me that Mike Nowak appears to be doing well at his own restaurant. I found our dinner to be nicely conceived and very well executed, and particularly enjoyed the rabbit dish. I’m looking forward to our next trip to Cleveland so I can explore more of the menu (and visit the very pleasant-looking Nano Brew next door), since The Black Pig obviously has a lot more to offer.